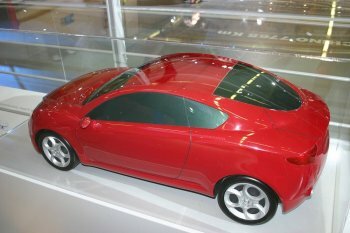 Scale models offering their interpretation of an all-new B-segment Alfa Romeo coupe were presented at the Bologna Motor Show earlier this month by the students of the Institute of Applied Arts and Design in Turin. 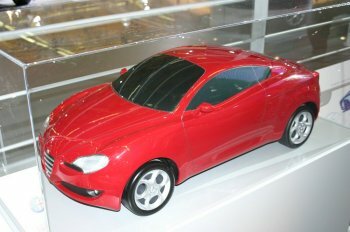 The models on show are the realisation of the project “Italian sportivity: the new generation”, which was carried out in conjunction with Alfa Romeo. The results were first shown in July at the Automobile Museum of Turin. Alfa Romeo set the students of the Transportation design course from the Institute of Applied Arts and Design in Turin the task of studying models destined for the market over the next decade. It was an important and significant style exercise that allowed, Alfa Romeo to examine and evaluate new ideas, and new talent. The study project called for a new coupè, spacing in the possibilities of a vehicle of B Segment with the chosen Inspiration being the Alfa Romeo 8C and GT Junior. The brand's main characteristics and proportions were to be retained, while the indications called for style without retrò characteristics. The realised projects presented for each participating student, historical and concept research boards, sketches, handmade and digital renderings, and for the best projects, chosen directly by the partners, prototypes in scale - six prototypes in 1:4 scale. The projects were developed in a semester with didactic purposes, and remained the property of the partners. With speculation recently centering on the possibility of a future B-segment Alfa Romeo 'sports coupe', much attention was focused on the models on show in Bologna.